You probably know from all the other sites that it's the 20 year anniversary of Happy Gilmore this week so I thought it might be nice to take a different angle. 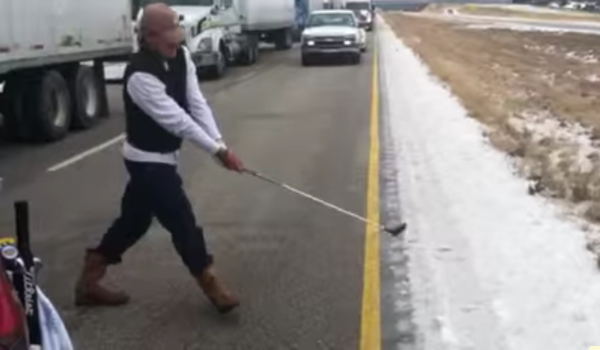 John Peterson does a Happy Gilmore on a frozen highway during a traffic jam. And when looking back at the collection of Happy Gilmore's on my Mac I noticed that the two with by far the most hits came from the same person, John Peterson. The first landed Peterson in hot water when he was accused of putting others in danger by hitting a drive during a traffic jam on a packed motorway. The second was when Peterson, with no chance of making the cut in Malaysia hit a Happy Gilmore drive during a PGA Tour event. Peterson uploaded the video to Instagram and Tour bosses accused him of breaching the moral code of trying 100% at all times. The banned John Peterson doing a Happy Gilmore during a PGA Tour event video.